The 2014 national curriculum and new KS2 SATs, appear, despite initial unhappiness, to be achieving a shift in the way maths is taught. 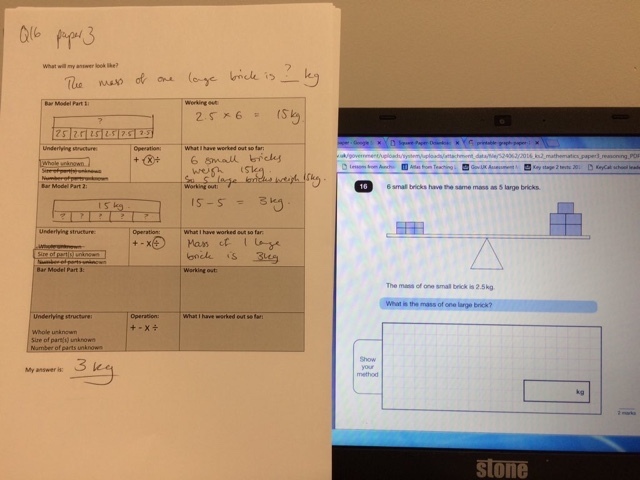 The three main aims of reasoning, problem solving and fluency have encouraged teachers to follow the techniques of maths mastery and seek further ways to encourage conceptual understanding, rather than just teaching tricks or rules. So teachers have looked towards countries who apparently churn out mastery-level mathematicians by the thousands for inspiration and teachers are learning to teach the ‘why’ rather than just the ‘how’. What is Singapore Maths-style Bar Modelling? Hailing from Singapore, with its champion being Dr. Yeap Ban Har, the bar modelling approach seeks to provide a visual for the inner workings of maths problems. There are plenty of places to find out more about how it works if you’ve not yet come across it. I’d recommend the Maths – No Problem! Youtube channel, Nick Hart’s blog and this post on how to ace arithmetic and word problems with bar models which gives you the basics. While Bar Modelling can be used to model some quite complex problems (pictured below – a comparative bar model), there are opportunities to use very basic part-whole bar modelling skills to represent multi-step worded problems. 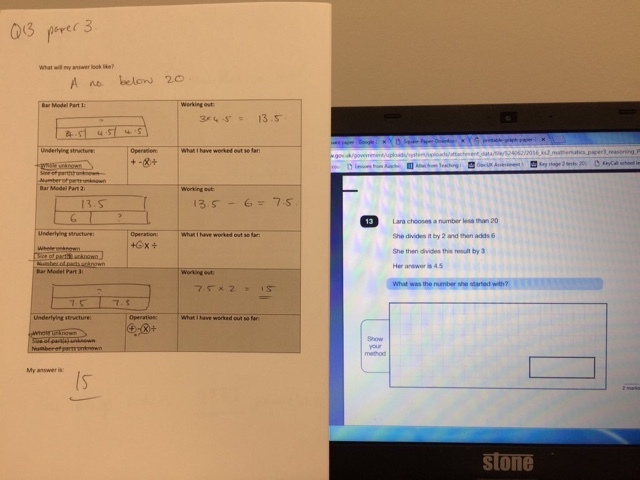 Having only introduced bar modelling to year 6 recently I wanted to find a way to make their new-found skills useful in their approach to answering SATs problems. All of the given examples are of 1 step problems but all similar problems in the KS2 SATs have at least 2 steps, some of them have 3 or 4. Having grasped the use of bar models for 1 step problems, I wanted to give the children a way to use their skills for multi-step problems. Essentially, any worded problem, regardless of number of steps, is a series of one step problems; children just need to identify the number of steps and the processes that need to be undertaken at each step. I say ‘just’, but that’s where most children struggle – very often children will complete some of the necessary steps, but not all of them. 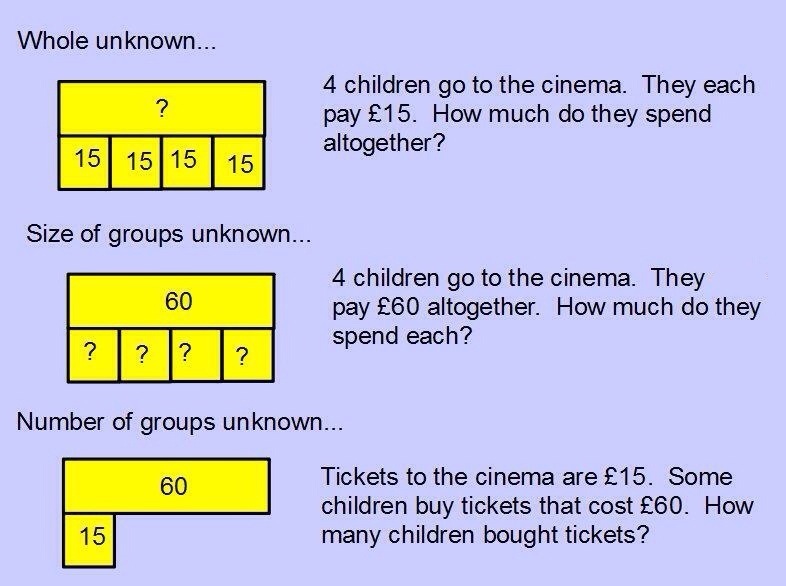 This was another reason to attempt to provide children with a structured approach to solving these kinds of problem. You will note the initial question: What will my answer look like? This encourages children to think about what their final answer will look like before they embark on the working out and provides a checking point to refer to throughout the exercise: after each step, children write a sentence explaining what they have worked out so far and then match it up to their answer to the question what will my answer look like? If they don’t match, then they know that they need to continue to work. These outlines can be made even more explicit. Taking the above example, part 1 could say: divide the cost of the bag of lemons by the number of lemons to find out how much each lemon costs. The idea with this is, of course, that eventually this whole scaffold will be removed and children will be able to visualise these types of problems without even having to draw bar models, although there is nothing wrong with a child drawing a bar model in the KS2 SATs, for example. Using this approach, albeit for a very short amount of time, many children, particularly those who have previously struggled with solving these kinds of problems, have begun to confidently and successfully work through these kinds of problems. It is worth mentioning that not all KS2 SATs problems can be solved using this process. This is one of a range of strategies children use during the tests. As such, there are further opportunities for children to practise identifying the types of question that can be answered in this way. 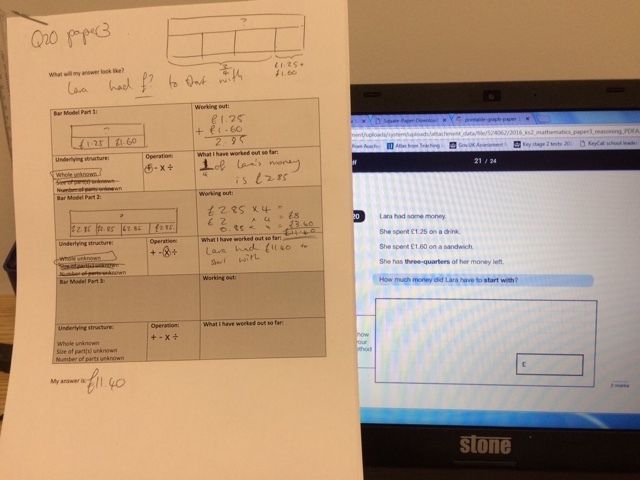 However, initially when teaching this technique teachers will need to provide particular examples, like these scaffolded Bar Model Maths questions or these which I uploaded to the TES website as a free download. Whilst this approach is more suited to KS2 work, there are also two-step problems in the KS1 SATs.